For those of you who love the outdoors and like to get a bit of exercise at the same time Harkerville State Forests are the place to go. 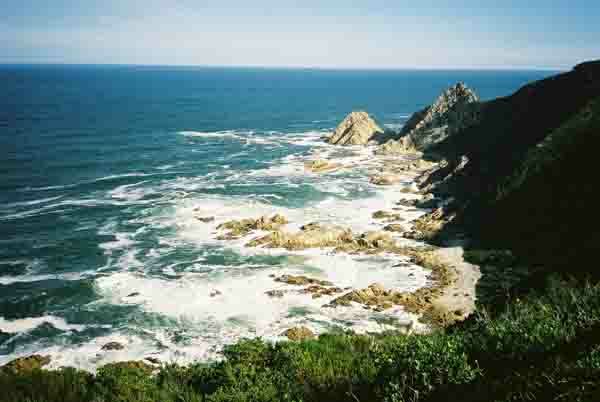 The forests are situated about 11 kilometres from Plettenberg Bay on the road to Knysna. The cyclist will be in his element in these forests. A number of trailss have been laid out through the forests with distances ranging from 12 to 24 kilometres. Not being cyclists we visited the forest by car and travelled along the one road available to motor vehicles in the forest. This narrow gravel road winds its way between the trees up hill and down dale until we reach the lookout point at the top of the cliffs overlooking the sea. The view over the cliff and down into the valley where a small river enters the sea is quite spectacular. When we arrived there were a number of baboons climbing on the wooden fencing that lines the top of the cliff. As we approached they disappeared over the side into the bush that clings to the cliff face above the sea. I don't know if they are stupid, but with a drop like there is on the other side of that railing you will not get me on to go there. There are a number of roads leading off the parking area and we decided to explore one of them which lead to a parking area for fishermen. We drove along the road for a couple of kilometres and the further we went the worse the road became. Eventually it was pointing straight down the side of the mountain and was very bumpy with large loose rocks on it. Real 4X4 territory, no good for an Astra. I started down this rough track and then decided that it was not safe. It was so narrow that I could not turn around and so had to reverse up this steep bumpy incline. It was a bit hairy but we managed. On our return trip we stopped at the picnic site that has been set up near the edge of a massive cliff. A river running past the picnic site drops over the cliff face nearby and becomes a very pretty waterfall. The same cliff face appears to be used by climbers who use ropes to lower themselves down into the valley below. 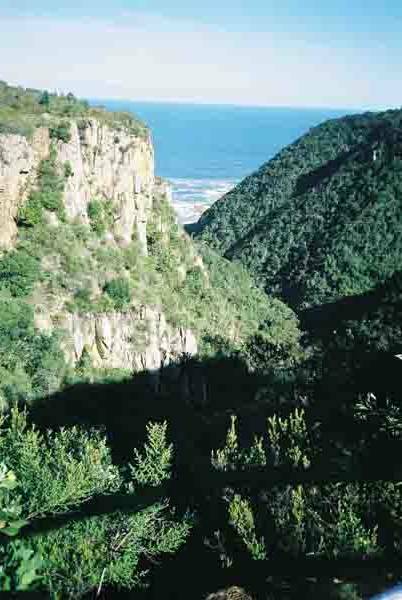 The vegetation along the cliff faces and into the valleys is the local fynbos. Plenty of proteas and other wild flowers. In the valley below the cliffs there are many of the indigenous trees that are found in the forests in the Knysna/Plettenberg bay areas. For those really energetic people who like to walk on trails there are a number of them starting near the picnic site. The first one starts with a river crossing, the river being just wide and deep enough to get your shoes wet. I did not do any of the walks but as the pathways lead along the top of the cliff faces the views must be quite spectatcular if the views we saw were anything to go by. This forest is only one of many in the area, so if you are a nature lover there is much to do. Visit Plettenberg Bay and explore to your hearts content.